Regenerate and renew the filtration provided by your Aqua Style 126 trickle filter with our Complete Filter Media renewal kit, containing replacement filter media for your AquaStyle 126. The freshest start for the best filtration. Maintaining your AquaStyle aquarium was never easier... Keep your AquaStyle 126 Aquarium in fantastic order with our great value genuine Aqua One Complete Renewal Kit. The easiest and most cost effective aquarium maintenance solution, from Aquarium Parts and Aqua One! 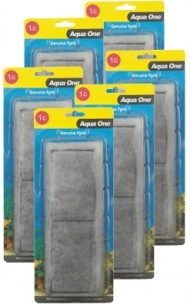 Genuine and Original Aqua One Wool Pads for use with AquaStyle (AR) 126, 380 and AquaMode 600 aquarium ranges. 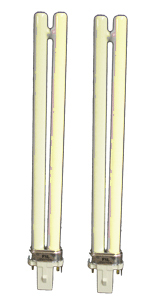 Great value Twinpack of Aqua One PL11 Sunlight (7.1k) / Tropical (8k) Fluorescent High Output Energy Saving Lighting Tubes. This Mulitpack contains 2 x PL-11 Sunlight / Tropical mix tubes, with 2 pin fitting. The AquaStyle 126 aquarium has it's very own trickle filtration system built in, which means that maintenance is exceptionally easy. As always, we recommend changing the wool pads once a month, rinsing the filter foams in a little aquarium water at the same time, but exchanging these every 6 months as they deteriorate over this period. Whilst exchanging your wool pad, it's always a good idea to remove a handful of the dirtiest bio noodles and introduce some new ones. Never change the bio-nood completely as they provide a home to essential nitrifying bacteria. A great tip for giving your water that final 'polish' is to squeeze in a bag of Advance carb or Chemizee down amongst the bio-nood on the bottom of your trickle filter. Either of these will really improve water quality and should be changed every four to six weeks when you change your Wool cartridge. Another great fish keeping tip is to always keep a spare filter pump impeller. These little devices are often the only moving part in your entire filtration setup and work incredibly hard, spinning several thousand times per hour. We can't stress enough the importance of keeping a spare aquarium heater as part of your essential set up. Don't be caught out when your aquarium heater fails, have a spare aquarium heater on hand to exchange immediately and so maintain water temperature and ensure your livestock are undisturbed. Choose from an extensive range of spares and accessories for your AquaStyle 380 Aquarium. Enjoy Free UK Delivery when you spend £30 or more or pay just £1.99 per order. And with prices like ours, there's never been a better time to keep your AquaStyle 380 Aquarium in tip-top condition. View our massive range of spare parts and accessories for the AquaStyle 510 Aquarium. Choose from a wide selection of fluorescent lighting tubes, replace filter media, change you pump impeller, buy filter cartridges and pads for your AquaStyle 510 model. Above all, buy with confidence at Aquarium Parts. Ensure your AquaStyle (AR) 620 is kept in the best possible working order with our complete range of genuine and original Aqua One spares and accessories. If your looking for cheap replacement filter cartridges and pads or any other AquaStyle 620 product, you'll find the widest choice at the best prices. Browse our full range of genuine Aqua One replacement parts, spares and accessories for your AquaStyle 620T Aquarium. We stock only original Aqua One products at the lowest prices in the UK. With same day despatch there's simply no reason to help us help you to maintain your AquaStyle 620T to the very highest standards. Find your parts, spares and accessories for your AquaStyle 850 Aquarium Setup. Buy faster, buy cheaper and especially please buy with confidence at Aquarium Parts. Simply put we've got the lot... filter pumps and impellers, fluorescent lighting tubes, filter cartridges and pads along with our great value Essential Maintenance Kits that are guaranteed to keep your Aquarium in great condition. Choose from the UK's largest range of genuine Aqua One spare parts and accessories for your AquaStyle (AR) 980 Aquarium. Looking for cheaper replacement filter media, pumps, impellers or lighting? 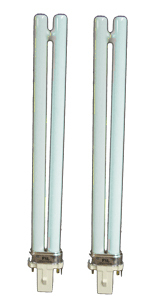 We supply the complete range of Aqua One consumables for the AquaStyle 980 Aquarium.